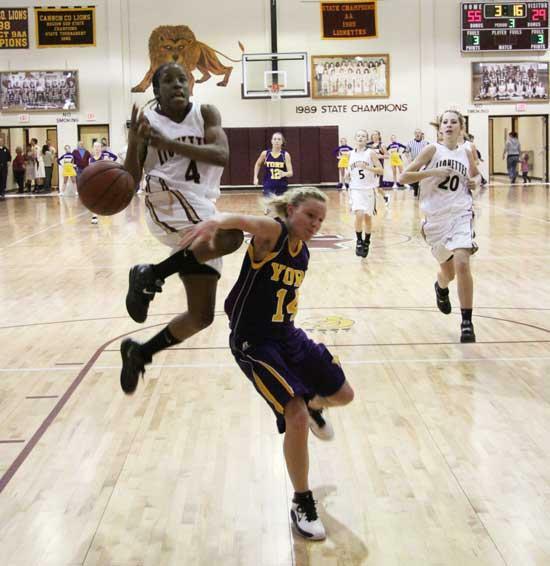 Cannon County JoAnna Young, 4, goes for a layup as York's Brookie Gammon, 14, cuts in front of her for the foul. The Lionettes turned back the Lady Dragons for a District 8-AA home win. Cannon County's girls basketball team spent most of the week soul searching after three straight district losses sent the Lionettes spiraling from the top of the District 8-AA standings to third in a matter of a week. Cannon County (19-5, 4-3 8-AA), which dropped from No. 3 to 8 in the AP Top 10 Class AA poll, appeared to regain its swagger in a 80-45 demolition of York at Robert A. Harris Gymnasium. Emily Sissom led four Lionettes in double figures with 23 and became just the third player in school history - boy or girl - to surpass the 2,000-point mark. Chelsey Payne added 12 points and Taylor King and Abbey Sissom finished with 11 for the Lionettes. Though York (9-10, 2-4) does not pack the same punch as league foes Livingston Academy or Upperman, it was the manner in which Cannon County played, regardless of the opponent, that pleased Lionettes Head Coach Michael Dodgen. "We were kind of doubting ourselves a little bit after (a 59-39 loss at Livingston Academy) Monday," Dodgen said. "We came in and had a talk Tuesday and we had, probably, the three best practices we have had in the four years these seniors have been here. They came in focused, they realigned their goals and they did what they needed to do. "You are going to face adversity throughout the season and you just have to get over it. We took a step in the right direction tonight." On a night when the contributions were spread throughout the team, King continued to be a stat sheet stuffer. The lingering effects of a recent flu in the rear-view mirror, King was as active as ever with a double double, 11 points and 11 rebounds, and also added six assists and four steals. King's jazz level helped Cannon County dominate in the paint, an area where the Lionettes were struggling of late. Payne also was strong inside with 12 points and five caroms. Abbey Sissom also had a strong all-around game with 11 points on 5-of-7 shooting, along with five assists and four rebounds. Emily Sissom knocked down five 3-pointers and was 7-of-12 from the field and surpassed the 2,000-point mark on a layup with 4:13 remaining in the third quarter. Whether Sissom would reach the milestone was the only question in the second half as the Lionettes had slammed the door on York much earlier. "We came back (to practice) Tuesday and it was like a completely different team," Emily Sissom said. "We were all working hard, coaches and players. We were all together. This game was big for us to come back out and play hard and play as a team. We needed to get back on track." Cannon County came out firing on all cylinders and led 25-10 after the first quarter and stretched the margin to 45-25 by halftime. The damage was done but the Lionettes were far from finished. They outscored York 26-8 in the third quarter to extend the cushion to 71-33 entering the final frame. "To me that shows a sign of a team that was hungry wand wanted to do some good things," Dodgen said of the third-quarter performance. Cannon County's players also shared the ball better than in previous games, as evidenced by 19 assists on 27 field goals. The Lionettes will travel to Tullahoma for a non-district game Monday (Jan. 31) before returning home for a 8-AA showdown against Livingston Academy Friday. Is that Michael "JoAnna" Jordan? Sweet picture! Looking like she is going to dunk it and hang on the rim! Way to go Lionettes on the big win! CONGRATULATIONS!!! to Emily for your accomplishment. The dedication, sacrifices and your hard work, has truly been a success. I am so BLESSED!! to call you GRANDDAUGHTER! Yea, JoAnna! Good to see another team member in action!